CCleaner is a powerful temporary file removal tool released by Piriform. Their tool has been an invaluable part of our toolkit for a long time, and it is one of the earliest tools which we automated through Kaseya. Since CCleaner clears out temporary files, we can keep systems clean, running fast, and often can avoid spontaneous issues from software getting clogged up with junk files. This script basically tests the system to see if CCleaner is installed and if it is up to date. If it is, then the script runs CCleaner with a preset config.ini file which is downloaded from our servers if not, then it downloads and installs the latest version available. Its literally that simple, and all you need to do is upload it to your Kaseya instance and then schedule it to run on your machines. But what if you want to customize the ini file? 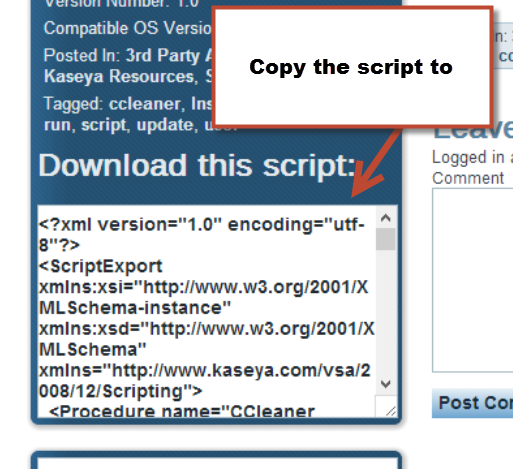 This is also possible with a simple change to the script which we can do quickly and easily before we import the new script into Kaseya (or you can edit the agent procedure in Kaseya after import to make this change as well). First thing is first, you need to download the config.ini at the following link: http://files.mymsp.com/va/files/ccleaner.ini . This is the most up to date version of the config.ini file. Once you have that, you can make some changes so that you clean the machine in any way that you please. You could also grab the ini file from the CCleaner folder in the program files folder. Once you’ve modified it, you will need to upload it to a public facing website (probably your own website). This will allow your machines to find the modified ccleaner.ini file so CCleaner only cleans what you wish for it to do. Now you need to make a minor adjustment to the script. 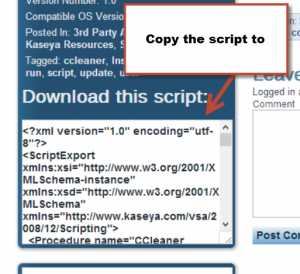 To modify the script, you can copy the XML into notepad and simply change the URL of the INI in the script before you import it into Kaseya. Then import and execute it on your machines.